At least it wasn’t the thing that killed the rabbits. Do not date Living-Dead Girl! She’s so Goth she’s DEAD! What is wrong with being a heck? And if she doesn’t know, why would she think he does? It’s her death wish, after all. 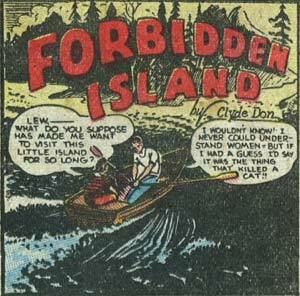 You know, I’m thinking the owner of “Forbidden Island”, one Clyde Don, probably spread some gossip about town of a “thing” that eats cats to keep people away; he was a convicted flasher, sadly and this was the only place he could relieve his compulsions. Little did the residents of that town know, but ALF a.k.a Gordon Shumway wasn’t the first Melmacian to visit Earth. Dingus Cowlick came to Earth in the late 30’s as a surveyor. His job was to measure Earth’s dimensions and discover if any “spazium” deposits existed for the people of Melmac. He found none and when his work was completed, he left, only noting that should Melmac ever face a cat shortage then Earth would be suitable for food gathering missions. Nothing says “date” like getting torn apart by a killer cat on a forbidden island. Love has changed hasn’t it.